During 1909-1910 the tsar government began to implement some reforms in the Caucasus and government was strongly controlling of activities of free thinking intellectuals of Azerbaijan connected with these reforms. Due to this reason some writers were compelled to leave Azerbaijan. At I stage the Azerbaijani migration literature was founded and representatives of this time influenced well to forming of the ideology of migration literature. Among prominent representatives of this stage are Alibey Huseynzade, Ahmed bey Agaoglu and Mammad Amin Rasulzade. It is necessary to note during living in Iran M.Rasulzade had begun to publish the first European standard newspaper İrani-novin in the East. Some works published later in Azerbaijan and Turkey were written by author while living in Iran. A.Huseynzada and A.Agaogli were living in this time in the Istanbul, they functioned in Turk ojaqi and “Ittihad and Tereqqi” societies. This stage covers the period from first years of soviet rule to WWII. That time the Bolsheviks implemented the heavy terror and repression against musavatists, ittihadists. Some notable intellectual left Azerbaijan in the result of it. 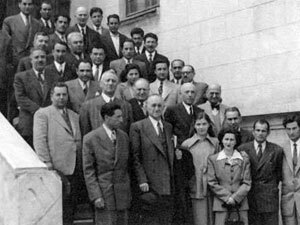 Among them were M.B.Mammadzade, A. Yurdsever, A. Topchubashov, Y.V.Chamanzaminli, J.Hajibeyov, A.Jafaroglu, K.Oder , H. Baykar, A.Ildirim and others. At this stage outstanding representative of Azerbaijani migration literature were lived with truth loving senses, motherland nostalgia, and some bitter fate. During Soviet period the persons listed above were declared as traitors in their countries and the nation enemy image was created on them. At Soviet press letters are organized regularly and they was labeled with people enemy, motherland traitor. Azerbaijani newspaper and journals which began to publish from 1922 gave a great impetus to development of the migration literature. Works of the representatives of this time are published and spread in Turkey, some countries of the Europe. Journals like “Yeni Qafqasya, Azeri-Turk, Odlu yurd, Azerbaijan country knowledge , Gurtulush , Bildirish”, Istiqlal etc newspapers were publishing in different cities of the Europe. Beginning of this stage coincides with beginning of WWII. Many Azerbaijanis taken captive by Germans could not return home for political reasons. Soviet government was supposing that the soviet soldiers been captivated to Germans serve to organ of secret service of German. Therefore many soldiers released from captivity when retuned home used to be re-exiled or arrested. Among them were writers and poets that did not return to the Soviet Union after war and defining the future of development of Azerbaijani migration literature. It is necessary to note that compared to periods the creative potential of this period was not so big. But in spite of all difficulties, this generation of migrant writers could play significant role in development of our literature. Works of these writers were published in Azerbaijan newspaper publishing in Germany and inTurkey press. The most notable representatives were M. Kangarli, A.Daghly, S.Takiner, M.Musazade.